In this part we import the required libraries for the tutorial. The script requires Gempy as well as Numpy and Matplotlib. We configure a Jupyter option for the interactive representation of Matplotlib graphics after the script cells (%matplotlib inline). Notice the that warnings are only messages that the user have to take in mind when running the script, they do not mean a failure of the code. Since this tutorial is on Windows some complementary libraries were unable to install but the overall performance of the geological modeling code is complete. The tutorial creates a grid of 100 col x 100 rows x 100 layers over a extension of 2km x 2km x 2km. Higher resolutions are posible but the computational time will be higher. The coordinate system is of local coordinates, comming tutorial will evaluate the performace of Gempy with UTM coordinates. The orientation and geological contacts are imported from CSV files and converted into a Pandas dataframe. Then the geological series (faults / formations) are defined as well as the geological formation sequence. Its important to mentions that faults have to be inserted independently, where the youngest is the first entry. Gempy has some useful features to represent the defined geological series and formation sequences. The different datasets for the geological model construction can be accessed though the ".get_" functions of Gempy. In this part 2D and 3D representations were done to present the interfases and orientations. Once the input data is ready, we can define the data and parameters for the interpolation with the InterpolatonData method from the Gempy library. The geological model is calculated under the "compute_model" method. Results from the model process are the lithology and faults on the same array dimensions as the geo_data. The lithology block has two parts, the first one has information about the lithological formation, while the second represents the orientation. In this part the distribution of lithology and fault-separated information are represented as histograms. As any other Numpy array, the resulting lithological blocks can be represented on Matplotlib. However, Gempy have special methods for cross section representation. 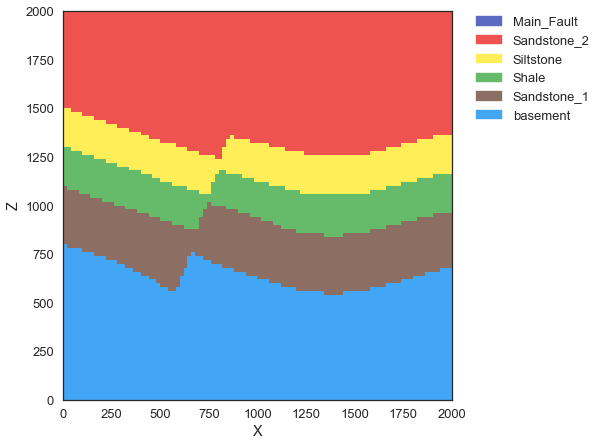 With the use of Jupyter widgets an interactive representation of the geological cross sections along the Y direction is performed with a handelbar to shift along rows.